Mel Tillis, who died today at 85 was a talented singer and prolific songwriter (over 1,000 songs written). 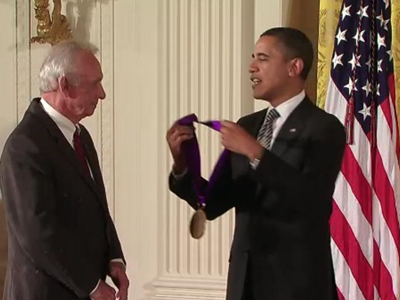 He is one of ten country musicians to have been awarded the National Medal of Arts -- the photo shows him accepting it from President Obama -- and so joins Roy Acuff, Bill Monroe, Doc Watson, Eddy Arnold, Johnny Cash, George Jones, Dolly Parton, Linda Ronstadt, and Ralph Stanley. The clip above shows Mel singing "Coca Cola Cowboy," a song that was featured in the movie Every Which Way But Loose, as performed at the Grand Ole Opry in 2009.